Summer Concerts are a great way to have an evening of fun with the whole family - for free! Summertime on Long Island means you won’t have to search far and wide to find live musical performances. There are a handful of popular venues in Nassau and Suffolk that offer a summer concert series. 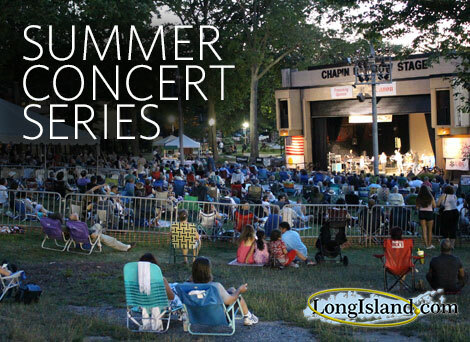 All genres of popular music, on both indoor and outdoor stages, including age-appropriate performances make Long Island Summer Concert Series among the most relaxing and memorable seasonal activities. The best part is that many of these open-air performance performances are completely free to attend. All you'll need is a blanket or a chair, a few snacks, and a some of Long Island's beautiful Summer weather. These concerts are a great way to make any weeknight a mini stay-cation on Long Island. From Strong's Marina to to the Port Jefferson Ferry to Main Street in Kings Park, there'll be a concert taking place nearly every day of the week. Performers are mostly local artists and cover a variety of genres. Great tribute bands will play the songs you know and love in a casual and relaxing atmosphere. These concert series come back every year thanks to popular demand. Show your support for local artists and have an amazing Summer night out on Long Island. You’ll definitely find a concert series taking place this Summer on Long Island to get excited about on our list below. Montauk's Free Summer Concert Series - Coming Soon! Presented by the Montauk Chamber of Commerce, the summer concert series is free to the public and will feature a variety of musicians including The Realm and Joe Delia and the Thieves. You can catch a show every Monday at the Montauk Village Green beginning at 6:30 PM in June/July and 6 PM in August. Mary Jane Davies Green Summer Concerts - Coming Soon! Whether you are a fan of oldies, country out of Nashville, or rock of the 80s, Mary Jane Davies Green has the summer concert slate that will be your soundtrack of summer! All concerts are at 7:30 PM on Mondays between July 9th and August 6th. Bay Shore Brown-Bag Lunchtime Concerts - Coming Soon! The best excuse to take a long lunch on a Tuesday, this free concert series on Main Street in Bay Shore offers a little bit of everything from reggae to bluegrass. Concerts are held at 12:30 PM every Tuesday throughout July and August. Northport Harbor Family Nights - Coming Soon! A portion of Main Street in Northport Village will be closed to accomodate two nights of live music and outdoor dining. In addition, local stores will be having sidewalk sales and there will be antique cars to enjoy. Clark Botanic's Tuesday Night Summer Performances - Coming Soon! Between performances by the Cunningham Brothers and a live production of The Wizard of Oz, Clark Botanic Garden's summer performance series is going to be hotter than summer itself! Shows are scheduled every Tuesday at 7 PM between July 10th and August 14th. East Quogue Village Green Concert Series - Coming Soon! The Village Green in East Quogue will come alive this summer with five concerts in a variety of styles. Presented by the East Quogue Civic Association, East Quogue Chamber of Commerce, and the Town of Southampton, this concert series will give locals plenty of reasons to tap their feet on Tuesday evenings. Village of Cedarhurst's Under The Gazebo Series - Coming Soon! With fantastic concerts being held every Tuesday through July and August, Cedarhurt is the place to be for a wide variety of musical acts this summer! Pre-shows begin at 7 PM and the main act will take the stage at 8 PM. Downtown Rocky Point's Summer Concert Series - Coming Soon! Legislator Sarah S. Anker is presenting a series of four great summer concerts for this year's Downtown Rocky Point Summer Concert Series. Thanks to performances by Strawberry Fields and Mike DelGuidice & Big Shot, this series is one not to be missed! Nesconset's Summer Concerts at The Gazebo - Coming Soon! Enjoy Tuesday night concerts at The Gazebo in Nesconset. Bring your lawn chair, blanket, and family/friends for a great time with some fantastic bands! Summer Concerts at Grant Park - Coming Soon! Grant Park in Hewlett will be hosting a couple of exciting tribute shows this summer. Featuring performances by Who Loves You and Endless Summer, fans of 60s music will be in bliss! Summer Concert at Christopher Morley Park - Coming Soon! Enjoy a performance by acclaimed Beatles tribute band, Beyond Fab, at Christopher Morley Park on July 24th! Village of Great Neck Plaza's Summer Concert Series - Coming Soon! Presented by the Village of Great Neck Plaza, Tuesday nights throughout the summer will be filled with the sounds of expertly-played live music! Enjoy a packed concert series including performances by The McLean Avenue Band, Sugar & Spice, and more! Noontime Concerts at Eisenhower Park - Coming Soon! Spend lunchtime at Eisenhower Park this July and August for a series of live shows with acclaimed artists. From Tangerine to Johnny Avino, there will be plenty of memorable tunes to enjoy at the beautiful park. Port Jefferson's Sunset Concerts - Coming Soon! With concerts at Jeanne Garant Harborfront Park every Wednesday at 6:30 p.m., guests are invited to enjoy free music on Long Island’s North Shore. Bring a picnic blanket and some snacks, and sit back, relax and enjoy the mid-week musical charms. In the event of rain, concerts will be held on first floor of the Village Center. Audience members at the July 23rd Port Jefferson Station-Terryville Summer Concert Series. Port Jefferson Station-Terryville Summer Concert Series - Coming Soon! Presented by Suffolk County Legislator Kara Hahn and Brookhaven Town Councilwoman Valerie Catright, this series consists of five outdoor concerts running in July and August. Don't forget to bring a lawn chair! Summer Concerts at Chelsea Mansion - Coming Soon! East Norwich's Chelsea Mansion will be the site of two exciting performances this August. Between the Nassau Pops and the Plaza/Funny Girl Concert, Long Islanders will certainly have a couple of reasons to visit the historic site. Summertime In The Park Concert Series - Coming Soon! Wednesday nights in Bay Shore will be filled with the sounds of the Bay Shore-Brightwaters Symphonic Band concerts and plenty of other featured musical acts over the course of this exciting summer series. Town of Babylon Summer Concerts - Coming Soon! With some of the hottest original acts and tribute bands in the country, the Town of Babylon's Summer Concert Series is one of the hallmarks of the South Shore's entertainment slate! Over a dozen conerts are scheduled across the span of less than two months, so grab your chair and prepare for a summer of unforgettable tunes! Valley Stream's Summer Concert Series - Coming Soon! The Village of Valley Stream will be celebrating the arrival of the summer season with a plethora of live performances at the Community Bandshell behind Village Hall. All shows are scheduled on Wendesdays at 8 PM with an additional show on Tuesday, August 28th. Alive After Five - Coming Soon! Patchogue's Alive After Five concert series celebrates its 17th year this summer, and it's expected to be better than ever. Six stages with live music and entertainment, more than 90 vendors of crafts, food and beer will bring Patchogue to life this summer on four Thursdays across June, July and August starting at 5 PM. Alive On 25 - Coming Soon! Featuring live music, street vendors, craft beverages, and a variety of family-friendly activities, Alive on 25 will bring tons of action to Downtown Riverhead during the summer months! Westbury's Summer Concert Series - Coming Soon! The Piazza Ernestro Strada on Post Avenue and Maple Avenue in Westbury will be hosting family concerts and performances through the end of summer! Enjoy a diverse selection of theatrical performances, live bands, and cultural celebrations. Smith Haven Mall Summer Concert Series - Coming Soon! The series will begin in July and will feature weekly performances by different cover bands playing all of the classics you know and love. Concerts will take place all throughout summer and will end in early September. Northport's Summerfest Concerts - Coming Soon! The Robert W. Kruger Bandshell in Village Park will be the location of five exciting Summerfest concerts this August. Concerts are sponsored by the Northport Chamber of Commerce and will cover a variety of styles. Community Band Concerts in Village Park - Coming Soon! The Robert W. Krueger Bandshell at Northport's Village Park will be the site of weekly community band concerts during the summer! Enjoy the sounds of live music as you take in the beautiful harbor views of Northport. Dennis Cannataro Family Summer Concert Series - Coming Soon! Start your weekend early by checking out a cover band of some of your favorite bands of all time. This series features a tribute to some of the most popular bands in rock and roll, featuring music by BIlly Joel, Fleetwood Mac, and plenty of others. Summer Harborside Concert Series - Coming Soon! Port Jefferson's Summer Harborside Concert Series has become a tradition in the town - and for good reason! With a great variety of musical acts, the series is able to take advantage of the town's fantastic atmosphere! Concerts will be held on Thursday nights beginning at 8:00 p.m.
Riverhead Townscape Summer Concert Series - Coming Soon! With musical acts ranging from rock bands to jazz and bluegrass, the Riverhead Townscape Summer Concert Series is simply limited to its focus on showcasing great musicians! Concerts take place at the Polish Town Pavilion on Friday nights at 7 PM throughout July and August. Musical Happenings on Main Street - Coming Soon! 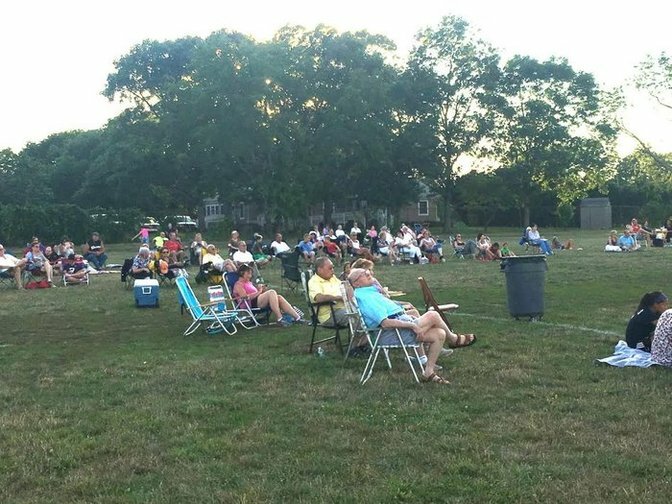 Bring your lawn chairs and blankets to Northport Village Park for a weekly summer concert series! Located at the scenic Northport Harbor, a great slate of live musical acts will perform against a beautiful, scenic backdrop! Musical Moments in Kings Park - Coming Soon! Every Friday night, head down to Main Street in Kings Park to enjoy live outdoor music and local restaurant specials in celebration of the warm weather. The series features local artists and the music starts at 7:30 p.m. You'll have to bring your own seating, but the entertainment is guaranteed free of charge! Glen Cove Friday Night Downtown Sounds - Coming Soon! Summertime in Glen Cove means a weekly celebration at the Village Square! With musical acts in a variety of styles and genres, the concert series should appeal to music fans of all types! Be sure to arrive in Glen Cove early or stay after the show to experience the great local shops and restaurants! Bellport Bandshell's Summer Concerts - Coming Soon! Featuring a dozen concerts in genres varying from country music to acoustic folk, the Summer Concerts at The Bellport Bandshell guarantee an entire season filled with fantastic weekly concerts for all ages! Sound of Summer Concert Series - Coming Soon! Strong’s Water Club and Marina brings back its popular summer concert series to Long Island’s North Fork for its sixth consecutive year. Guests are invited to enjoy listening to the free concerts at the water’s edge on Saturdays from 4:00 PM to 8:00 PM. Pace’s Dockside will be offering a special menu for guests who come to enjoy the five concerts planned for this summer. Summer Performances at Manorhaven Beach Park - Coming Soon! The Town of North Hempstead has announced free performances at Manorhaven Beach Park this July and August! Grab your chair and head down to Port Washington for evenings of great entertainment! Village of Lindenhurst's Summer Concert Series - Coming Soon! The Village of Lindenhurst will be celebrating the summer season with ten Saturday performances that will have Long Islanders cheering! From performances by The Good Rats to Unbroken Chain, there are a variety of rocking concerts that are sure to please everyone. Sunday Afternoons at the Beach Concert Series - Coming Soon! A wide variety of musical acts gather at North Hempstead Beach Park for their annual summer concert series! Shows take place every Sunday between July 8th and August 5th, and the schedule covers music genres from country to oldies! Jazz on the Steps - Coming Soon! Ten unmissable concerts are on the schedule for this year's Jazz on the Steps series at the Southampton Arts Center. Perfect for children and adults alike, these performances will feature the magic of jazz music through a variety of instruments and playing styles. Concert Series at Bayard Cutting Arboretum - Coming Soon! Beginning mid-July, this series combines the season's best foliage with some excellent tunes. The performances will liven up Sunday afternoons for six consecutive weeks through the end of August. Sunday Night Concerts on Gosman's Dockside Stage - Coming Soon! Featuring local favorites like Randy Jackson, Nancy Atlas, and more, Gosman's Dockside Stage will be the location for great Sunday night concerts throughout the summer! Summer Concerts On The Village Green - Coming Soon! Every Sunday night from 7 PM to 9 PM you can stop by the Green in Stony Brook to hear a wide variety of live music, including Jazz, Swing, Big Band, Rock and Roll, Pop, and Motown, just to name a few! Southampton's Concerts In The Park - Coming Soon! The Southampton Cultural Center will be sponsoring a summer concert series packed with 10 great shows this summer, including performances by the Lone Sharks, Billboard Live, and plenty of others. Concerts are held on Wednesdays at 6:30 PM and various other days. Medford Summer Concerts - Coming Soon! Beginning in July, these Summer concerts will feature different style bands playing a mix of all varieties of music. Bands are still being scheduled and will be announced in the near future. Under The Stars Concert Series - Coming Soon! Smithtown's Family Concert Series at Hoyt Farm - Coming Soon! The Smithtown Recreation Department has assembled eight concerts and performances for this year's free concert series at Hoyt Farm, including renowned tribute acts and a season finale by Funk Philharmonik! International Nights at Eisenhower Park - Coming Soon! Throughout the summer months, Eisenhower Park will be hosting a variety of International Nights to celebrate a variety of cultures and traditions! Each of the unique nights will feature a variety of performances to honor and educate. Summer Concerts in Memorial Park - Coming Soon! Bring your friends, a lawn chair, and a snack as you settle in for a night of family-friendly entertainment at Memorial Park! This year's schedule features The Idol Kings, Dr. G's Voices for Veterans, and a production of The Wizard of Oz. Town of Hempstead's Summer Concert Series - Coming Soon! With concerts spread across well over a dozen parks, the Town of Hempstead has packed their Summer Concert Series with the most diverse selection of bands yet! From Fleetwood Mac to Billy Joel, there will be enough musical talent to keep your foot tapping all summer long! City of Long Beach's Summer Concert Series - Coming Soon! Four concerts each week from July through August ensures that Long Beach residents will be tapping their feet to the music all summer long! Concerts are held at various locations throughout the City of Long Beach. Lakeside Theatre's Summer Concert Series - Coming Soon! Long Islanders are invited to attend Nassau County's incredibly diverse slate of free concerts scheduled for this year's summer concert series in Eisenhower Park! With almost two dozen concerts, there is guaranteed to be entertainment for music fans of all genres! Music Under The Stars - Coming Soon! Town of Oyster Bay's Music Under The Stars will have your foot-tapping during July and August with renowned musical acts! From BonJourney to Barometer Soup, spice up your summer with some of the bands that have provided the soundtrack to your summers over the years! Summer Concerts at The Jones Beach Bandshell - Coming Soon! If you're looking for a variety of summer entertainment, ranging from the hottest tribute acts to children's artists, it won't be easy to top the Jones Beach Bandshell! With free entertainment scheduled most days between June and early September, there's always a few reasons to head to Jones Beach! Huntington Summer Arts Festival - Coming Soon! Between jazz, indie rock, folk, dance performances, and theater productions for children, the Huntington Summer Arts Festival will be filling Heckscher Park with music and artistic performances all summer long! Grab your chair and head down for an unrivaled good time with friends and family! Don't see your favorite Summer Concert Series Listed? Let Us Know, and We'll Make Sure It Gets Added to Our Guide! Looking for more fun and free events this summer on Long Island? Check out our Events Calendar for a ton of great ideas!